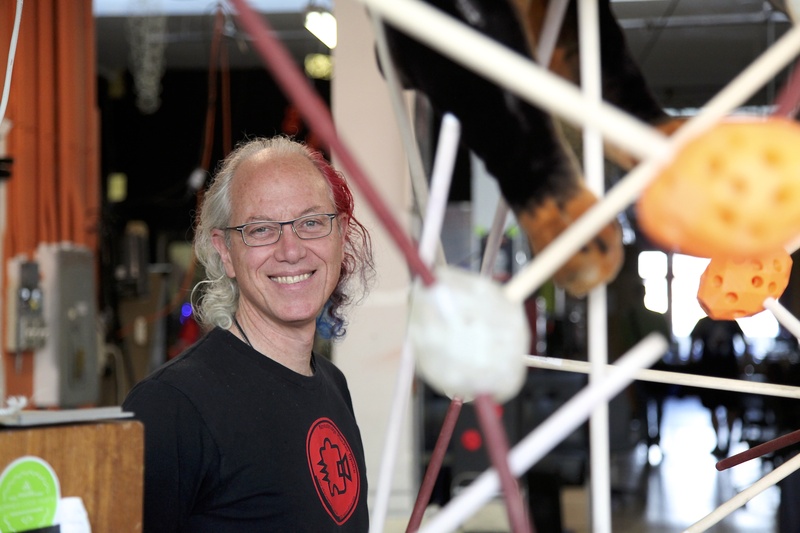 When Noisebridge opened the doors of its first hackerspace location in San Francisco’s Mission district in 2008, it had nothing but a large table and few chairs found on the street. Today, it looks like a mad scientist has been methodically hoarding tools, inventions, art, supplies and a little bit of everything else for five years. 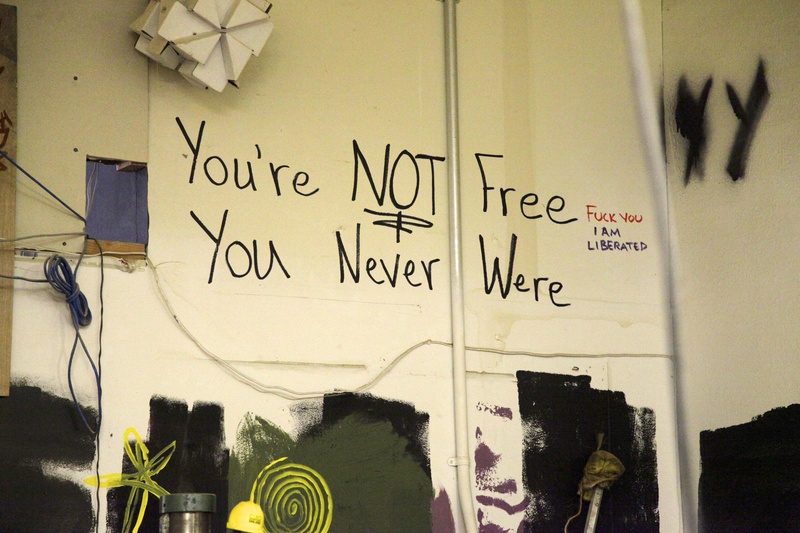 The 350 people who come through Noisebridge each week have a habit of leaving a mark, whether by donating a tool or building something that other visitors add to bit by bit. Anyone can be a paid member or a free user of the space, and over the years they have built it into a place where you can code, sew, hack hardware, cook, build robots, woodwork, learn, teach and more. The members really are mad scientists. Anything left out in the communal spaces is fair game to “hack into a giant robot,” according to co-founder Mitch Altman. Members once took a broken down wheelchair and turned it into a brainwave-controlled robot named M.C. Hawking. Another person made pants with a built-in keyboard. The Spacebridge group has sent high altitude balloons to near space, where they captured gorgeous videos of the Earth. And once a month, the Vegan Hackers teach their pupils how to make classic fare like sushi and dumplings out of vegan ingredients. Altman said the power of a hackerspace becomes apparent when you look at projects that built off one another. A member once built an anklet that buzzes at the exact point that it faces north. After a few weeks, the wearer has an innate sense of direction. Then another member built a dress covered in vertical stripes of LEDs. The stripe pointing north glows. Altman, who is considered a pioneer of virtual reality and co-founded the electronics company 3ware, founded the space with computer security researcher Jacob Appelbaum after years of attending hacking conferences. He’d always felt like an outsider, but at the conferences he finally felt comfortable. He sat in on a lecture at the 2007 Chaos Communication Camp where a group of Germans described the process of starting a hackerspace and suddenly realized his sense of belonging didn’t have to end after each conference. Noisebridge began. A small group met at coffee shops each week, but quickly grew too large. They adopted a warehouse as an informal meeting ground and then in 2008 found their first space in the Mission. They outgrew that too, and in 2009 moved to their current location a block and a half away. Appelbaum isn’t around at Noisebridge anymore. As the former spokesperson for Wikileaks and spokesperson and developer for Tor, a network that anonymizes internet users, he became a frequent target for the U.S. government. He now lives in Berlin. His ideals live on in Noisebridge’s hosting of a Tor exit node, which is a necessary visible part of the network that allows other people to remain anonymous. It has brought the FBI to the door twice. Altman is also frequently absent, as he is constantly visiting hackerspaces and teaching beginning hacker courses around the world. But he’s at Noisebridge enough to know all the regulars and inspire lionizing among the newcomers. During a tour around the space, he doled out advice, hugs and conversation with unwavering patience to the dozen people who approached him. At 7 p.m. he began setting up for a circuit hacking class he was teaching that night. Being a free-to-all space has its problems. Homeless people are free to use the tools and resources, and have done so in the past to start a new source of sustainable income, but some only see it as a warm place to sleep. Money boxes and tools go missing on occasion. Noisebridge is also anarchist, which means there are no leaders. There is only one rule: Be excellent to each other. Members debate varying takes on the meaning of excellence in order to solve problems. Sometimes petty nastiness crops up on their mailing list. A handful of people have been banned from the premises for their behavior. But things have a way of working out, as evidenced by the calm collaboration and sheer number of projects happening on any given night. Even the dire financial situation Noisebridge found itself in in March resolved itself. About two-thirds of the space’s income comes from the $80 a month official members pay (or the $40 they pay at the “starving hacker” rate). The remaining third is made up of donations, be it $5 from a regular visitor or $1,000 from a kind stranger. A two month dip in donations left Noisebridge in danger of being unable to pay the $5,000 it needs each month to survive. A fundraiser and treasurer’s plead for funds brought in enough money to go on. 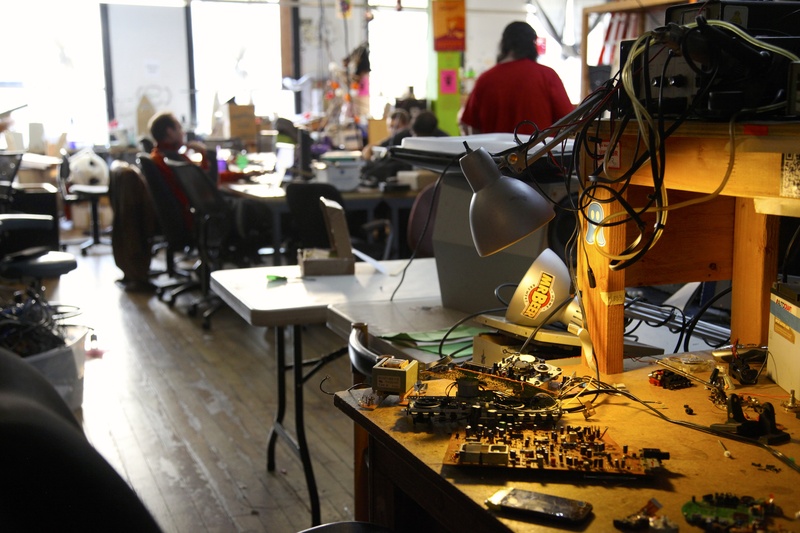 In the future, Altman wants to see many more hackerspaces brought to life; a million of them. Each one brings new opportunities for people to make a living, but also find what they love to do. This post was updated at 10 a.m. PT on August 22 with a high altitude balloon video created by Noisebridge members. The video originally included was by Sector67, a hackerspace in Madison, Wis. While we appreciate the publicity of the video of our high altitude balloon launch, it might be appropriate to attribute it to Sector67, the hackerspace in Madison, WI, that did the launch and video. We have created a guide at apollo67.com with instructions for doing your own high altitude balloon launch. Thank you for pointing this out. The story has been updated with the intended video produced by Noisebridge. The correction is noted at the bottom of the story.